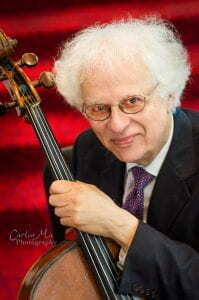 Laurence Lesser is a laureate of the 1966 Tchaikovsky Competition in Moscow and a participant in the historic Heifetz-Piatigorsky concerts and recordings. He has been soloist with the Boston Symphony Orchestra, the Los Angeles Philharmonic, the London Philharmonic, the New Japan Philharmonic and orchestras worldwide. He has collaborated with conductors such as Ozawa, Mehta, Levine, Rostropovich, Tilson Thomas, and many others. Lesser has recorded for Bridge Records, and on the RCA, Columbia, Melodiya, and CRI labels. He was the first to record the Schoenberg Cello Concerto (in 1966). As a chamber musician Lesser has participated at the Casals, Marlboro, Ravinia, Menlo, Spoleto, Banff, Orford and Santa Fe festivals, and over many years has been a guest of the Chamber Music Society of Lincoln Center in New York. He has served as a member of juries for numerous international competitions, including the Tchaikovsky Competition in Moscow in 1994 and 2007. In 2003 he was on the jury of both the Paulo Competition in Helsinki and the Feuermann Competition in Berlin, and the latter once again in 2006. In a life full of successful concerts, Lesser has always been passionate about teaching. His first position was as assistant to Gregor Piatigorsky at the University of Southern California, starting in 1963 and concurrent with his participation in the Piatigorsky master classes. A year later he was named to the faculty of the USC School of Music. During the years 1963-1970 he was an active member of the Los Angeles musical scene, playing regularly on the Monday Evening Concerts, recording under Igor Stravinsky, and paying his rent by working in Hollywood film and TV orchestras. He was on the faculty of the Peabody Institute, and is currently on the faculty of the New England Conservatory, where he served as president from 1983-1996. Lesser plays a 1622 cello made by the brothers Amati in Cremona, Italy.